Overnight North Texas storms have left thousands without electricity and canceled dozens of flights -- and the rain is expected to continue throughout the day Thursday. Oncor Electric crews are working to restore service to more than 13,000 after outages affected customers from Sherman to the Dallas-Fort Worth area and into Central Texas. American Airlines on Thursday canceled 35 flights in and out of Dallas-Fort Worth International Airport. Spokeswoman Dori Alvarez said the Fort Worth-based carrier on Wednesday canceled 140 DFW flights. In all, more than 3,000 travelers were stranded due to the weather. As storms dumped rain and hail on North Texas, heavy winds blew off the roof of a two-story apartment complex in Fort Worth. No one was injured. 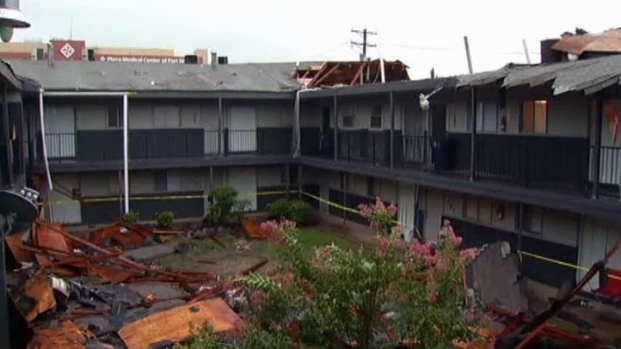 Strong winds Wednesday ripped the roof off of the Wayside Plaza Apartments in Fort Worth Wednesday night. Elsewhere, strong winds are being blamed for toppling trees, including a 100-year-old Cottonwood in Uptown Dallas. Despite the damage, no injuries have been reported. NBC 5 meteorologist Samantha Davies said showers and thunderstorms are expected throughout North Texas throughout the day and that a storm or two are possible on Friday. The high on Thursday is 83 with a low of 68 tonight. The weekend, however, should be relatively clear and dry. 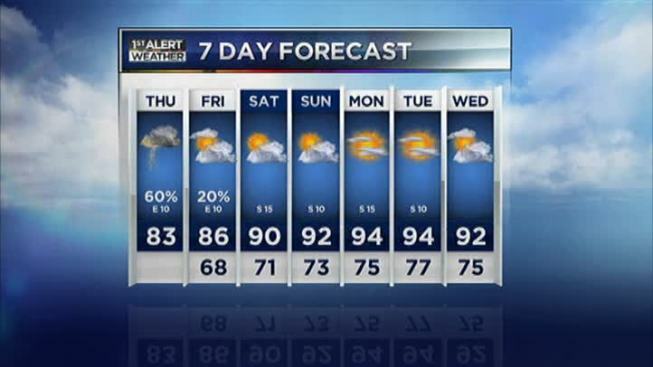 Next week, temperatures are expected to return to the mid-90s. Follow @nbcdfwweather on Twitter for updates from the NBC 5 First Alert Weather team throughout the day. Mobile users can download weather apps for their Android, iPhone or iPad devices by clicking here.